Now, I don't know about any of you guys, but I love to procrastinate. Homework, practicing piano, doing chores, writing these posts... But NaNoWriMo is when I (try) to put all of those distractions aside and focus on simply writing. Now, mind you, I'm procrastinating right now by writing this. I'm only 846 words away from my writing goal, and then I will have won. But, I'm taking a break, because after writing 600 painful words, I need some time to clear my head. So I apologize in advance if the way I'm writing seems a little off. My story is fantasy and my style of writing is a bit more... formal than normal. So, what is NaNoWriMo? I'll let the NaNoWriMo website tell you. That means participants begin writing November 1 and must finish by midnight, November 30. I am sure someone here has heard of it in English class or through a friend (I have made sure to tell a lot of my friends how hard it is to write SO much in a month, even though my word count goal is considerably low). Anyway, I find it fun, despite the hard work. The word count goal for adults is 50,000 but I created my own word count goal of 15,000. I know it's low but, for me to find time in my crazy life to write approximately 500 words a day is beyond amazing. And the fact that, after not writing for 3 days and then having to write 1,000 words a day, and actually being able to do that... I am very proud of myself! I just wanted to share this little achievement with you. After I validate my word count and "win", you can see my badge on the sidebar of the blog! But really, what I mean to do by all of this is to show that, if you have a really good excuse (doesn't matter if it's an actual reason or one you created), you are definitely more likely to accomplish something. For example, even though I don't have to do NaNoWriMo, I still tell myself that I basically made a commitment to myself, as a writer, to write 15,000 words by November 30 at 11:59pm. So, try making up an "excuse", "reason", whatever you want to call it, and go for something. Stop making other excuses you know are poor and are just to get you out of not doing things, and focus! You might just be surprised at what you can do! 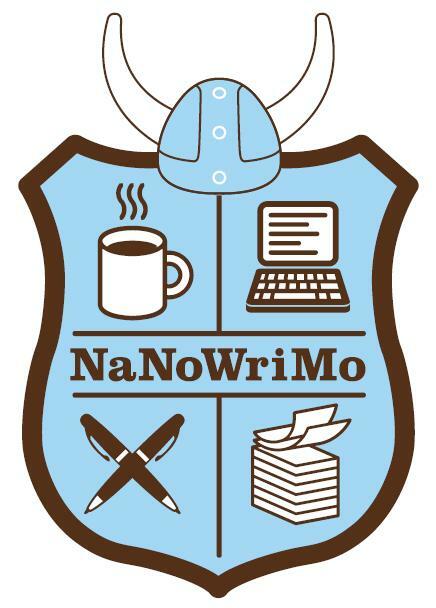 Who is doing NaNoWriMo this year? If you are, what is your word count goal? If you aren't doing NaNoWriMo, you definitely should! But even if writing isn't your thing, there's normally a time when you are pushed to do something you might not otherwise do. What are your techniques to keep up with the things you need to do? How do you stop yourself from blowing off the things you must get done? Share your ideas in the comments below! Now, I'm off to write 846 words... wish me luck! I'm way too chicken to commit to NaNoWriMo, but so many of my friends are doing it . . . I feel ashamed. November is such a busy month, though! I wish they would do it in January, Official Month of Good Resolutions. Anyway, this is my long-winded and self-centered way of saying: Good for you, rock star! !